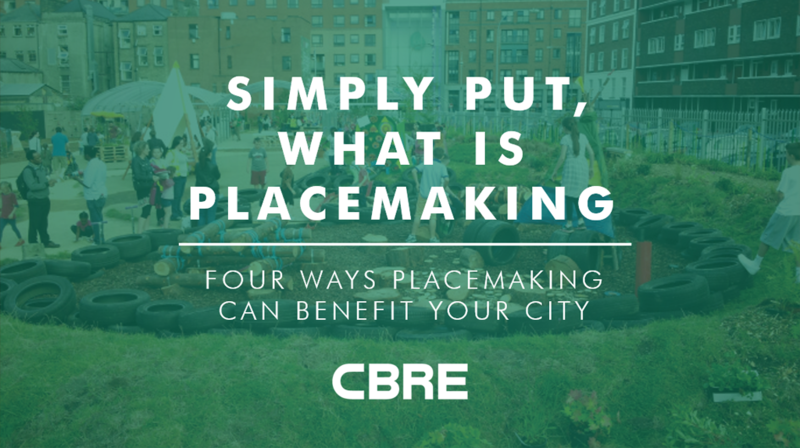 Simply Put - What Is Placemaking? BUILDING thriving, inclusive and healthy sustainable cities is perhaps one of the biggest challenges we face today – and there is no easy solution. However, one of the key ways to achieve this lies in the heart of the world’s urban areas – namely its public spaces. Placemaking - a buzz word that seems to be on the rise these days, beginning sometime in 2016 amongst “real estate types” – is not a new concept but only recently has it gained popularity and been thrown around many a boardroom with developers, investors, occupiers and agents alike. It has the power to transform spaces, (usually surrounded by mixed office, residential and retail use developments), into vibrant urban areas offering wellbeing, pleasure and inspiration. How cool is that? The prospects of having better improved lives, greater happiness, better work productivity and the possibility of an uplift in property values – who wouldn’t want to be part of this phenomenon? But what is, placemaking at its core? Simply put, placemaking is an all rounded approach to the planning, design, implementation and management of public spaces. The ideal is to create vibrant public spaces or realms that offer unique attributes to the area it is located. It is essentially a design approach that creates identity, increases collaboration and activities as well as contributing to the identity of a space. It should be ‘something for everyone’ with no exceptions – timeless and futureproof. It should offer a sense of belonging, security, atmosphere, inspiration and experience. Placemaking should offer people to feel a strong sense of pride in their communities. It is worth noting that many of the world’s iconic places are public spaces. CBRE has a report that looked closely at this ideal – and its impact on the public realm. Using various global case studies, we have come up with four key fundamentals of why we should make public spaces great. Historical or “old” areas can be redeveloped, providing authenticity, stimulates visitor flow and raises demand for real estate by prospective visitors and businesses. By redeveloping areas to house new uses and activities, placemaking acts as a support for ambitious redevelopment projects. Examples would include the High Line in New York and Federation Square in Melbourne. "What defines the character of a city is its public space, not its private space." By increasing the pedestrian areas and the areas where large gatherings can occur, can boost the area’s popularity as it gives the option of various public events that create buzz and bring people from the community together. Great public space implies that an area is for fun, recreation and meeting – not just for living and working. There is no doubt that our cities will continue to grow in population and industry. In this instance, more so than ever, we must now continue to strive to innovate and create areas of special interest for which we can safely and happily live, work and play. There is no doubt that public and private developers are more aware of this now and there are many tangible examples being created where new development is occurring. The bigger challenge may come where there is no new development and investment; local action groups, existing occupiers and residents will have to take up the gauntlet here to improve and futureproof their public realm. "There is no doubt that our cities will continue to grow in population and industry. In this instance, more so than ever, we must now continue to strive to innovate and create areas of special interest for which we can safely and happily live, work and play." We in CBRE are huge advocates of quality placemaking, as evidenced by our support of the inaugural ULI and CBRE “Excellence in Placemaking Awards” in Ireland. The awards will cover each of the four provinces and there will also be an overall national award. Entries close on 31st January 2019 and further details are available at the link below.